The Olav Thon Foundation recently announced the recipients of awards and financial support for research and teaching. Two ice2ice scientists from Bergen, Kerim Nisancioglu and Anne-Katrine Faber were awarded 1.5 mio NOK to their project “IceFinse – a field course on Arctic climate with focus on engaging students in research”. The project aims to give Master level students first hand experience with Arctic research and fieldwork. This course offer opportunities for learning that is not achieved in classical curriculum-based classes. By giving students insight into all steps of the research process, from formulation of a research question, to data collection and analysis and interpretation the course aims to engage students in research and prepare them to start working on their master thesis. This research-based field course on glaciology, ice cores and climate will be designed around the lecturers existing research. The studentdriven fieldwork and research projects will therefore contribute to ongoing research. 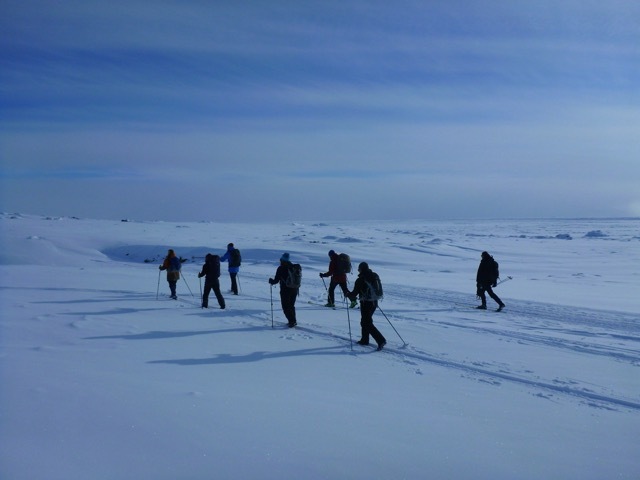 During the coming years they will develop and organize fieldwork courses at the research station at Finse in Norway (https://www.finse.uio.no/) and the research station “Arktisk station” (https://arktiskstation.ku.dk/). at Disko Island in Greenland. The scientists officially received the financial support for their project at a ceremony in Oslo on March 7th. 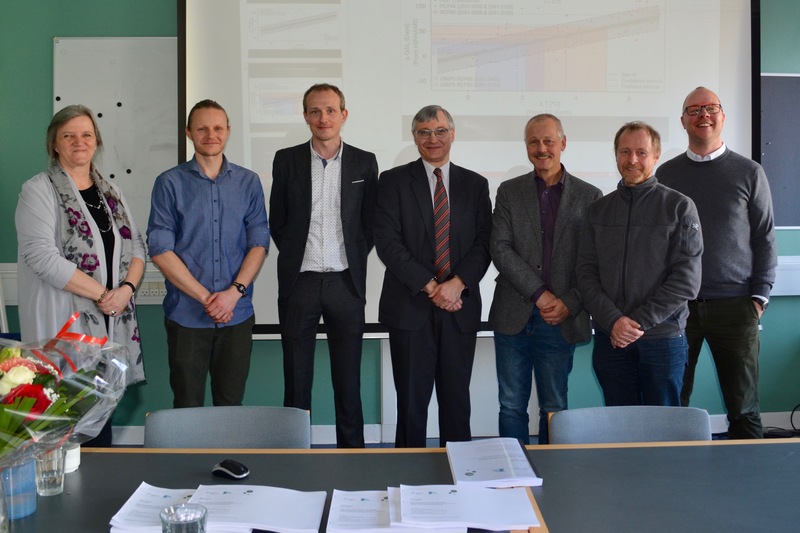 Andreas Plach successfully defended his thesis at the University of Bergen 5th March. The thesis is entitled “Simulation of the Eemian Greenland ice sheet“. 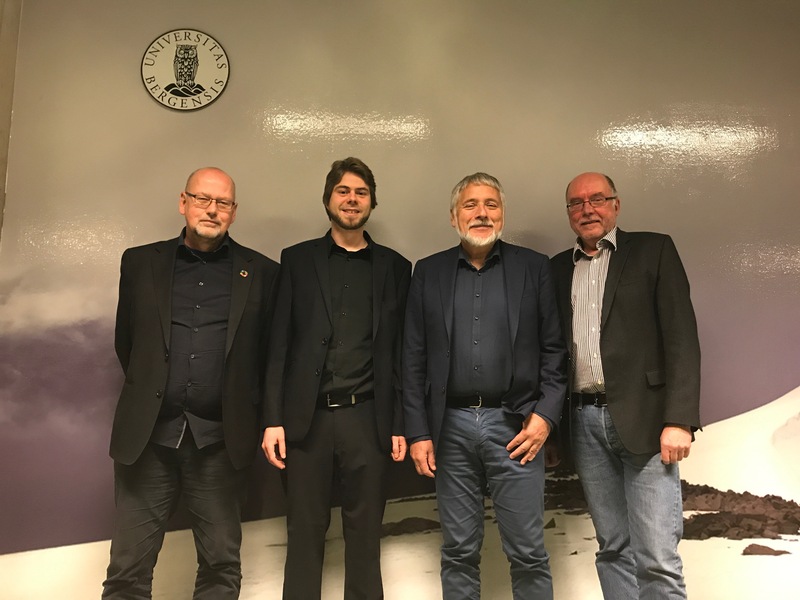 His supervisors has been Kerim Niscancioglu, Andreas Born (both University of Bergen) and Bo Møllesø Vinther (University of Copenhagen). The assessment committee consisting of Professor, ph.d. Anders Schomacker, Institutt for geovitenskap, Universitetet i Tromsø, Assistant Professor, ph.d. Miren Vizcaino, Department of Geoscience and Remote Sensing (GRS), Delft University of Technology, Nederland and Atle Nesje, Department of Earth Science, University of Bergen. You can read more about the thesis here, unfortunately only in Norwegian. 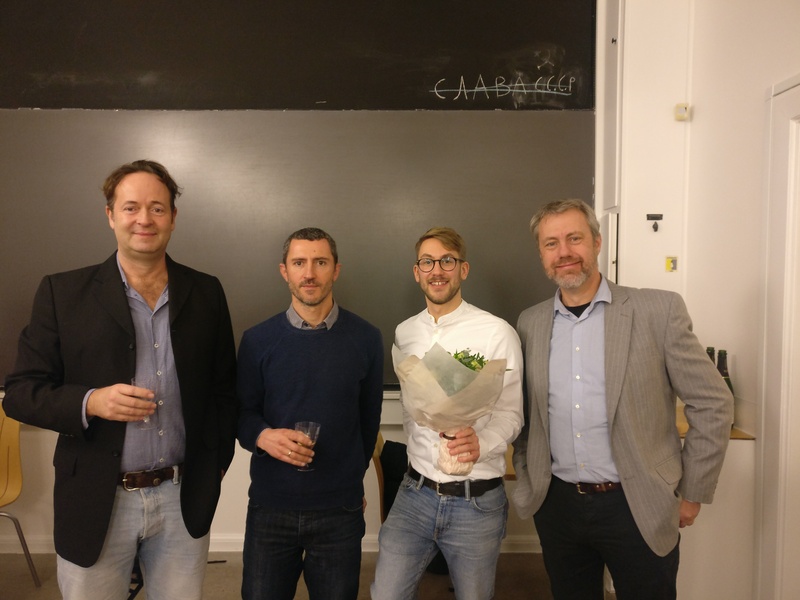 Martin Olesen successfully defended his thesis at the University of Copenhagen Monday 18th February. The thesis is entitled “High resolution climate simulation. Methods for improving and customising climate information with focus on outreach and uncertainty assessment”. His supervisors has been Jens H. Christensen, Peter Lang Langen and Eigil Kaas. 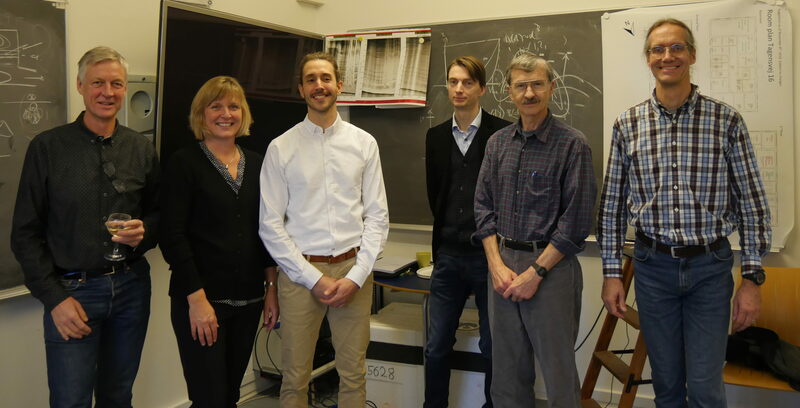 The assessment committee consisting of Aslak Grinsted, Niels Bohr Institute, KU. Prof. Dr. Daniela Jacob, GERICS, Institute Helmholtz-Zentrum Geesthacht and Research Prof. Tim Carter, Finnish Environment Institute. The last glacial period (ca. 10,000–100,000 years ago) was marked by repeated abrupt climate changes that had global implications. 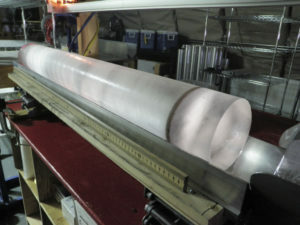 It is known from ice core records from the Greenland Ice Sheet that these glacial climate fluctuations comprised temperature shifts of up to 15°C over the Greenland ice sheet, happening within years or decades. These are the most prominent abrupt climate changes that we have recorded. While the underlying mechanisms of these so-called Dansgaard–Oeschger climate events are not yet fully understood, it is believed that changes in sea ice cover and ocean circulation in the Nordic Seas have played a key role in driving these enigmatic events. In his studies, Sadatzki investigated the nature, timing and role of changes in sea ice cover in the Nordic Seas during several abrupt Dansgaard–Oeschger climate events ca. 30,000–40,000 years ago. For this purpose, he extracted and analyzed specific organic molecules from marine sediments, which were produced by certain sea ice algae and other phytoplankton thousands of years ago. Sadatzki´s thesis documents sea-ice changes with an unprecedented detail, and show that in cold phases the sea ice cover was much more extended than today. The sea ice cover abruptly disappeared over large regions just prior to the abrupt warmings over Greenland. Abrupt changes in the sea ice cover thus have been important for creating the subsequent atmospheric changes. The results support theories that have suggested that the sea ice cover changes were critical for the abrupt changes. Sadatzki´s work provides unprecedented proxy evidence of expansion and retreat of sea ice in the glacial Nordic Seas, contributing to an improved understanding of the role of sea ice changes in abrupt climate change in the past, and with relevance for the ongoing sea ice reduction in the Arctic today. The results are about to be published in leading international journals. 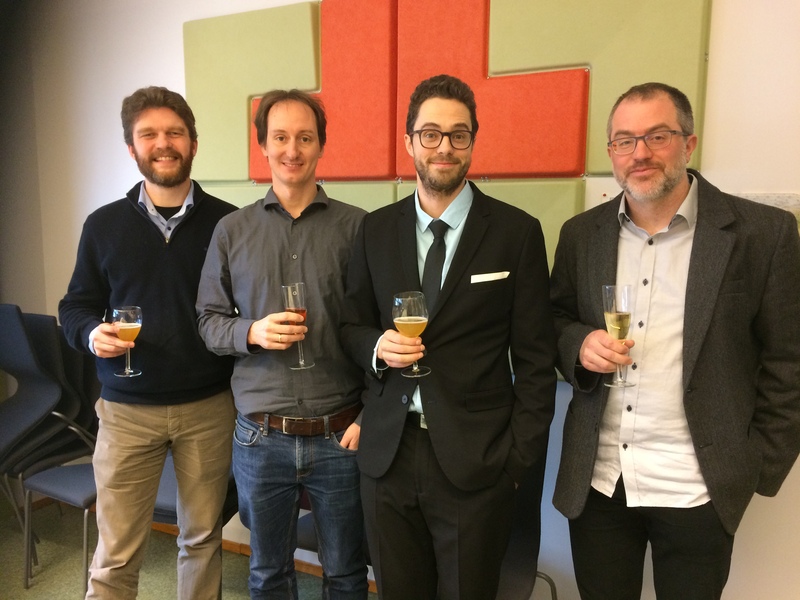 Ice2ice Phd Mads Bruun Poulsen succesfully defended his thesis on Parameterizing Southern Ocean eddy-induced circulation in coarse resolution ocean models. Ice2ice Phd Mads Bruun Poulsen the 16/01-2019 successfully defended his PhD thesis on Parameterizing Southern Ocean eddy-induced circulation in coarse resolution ocean models. 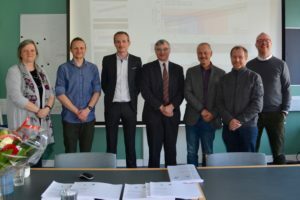 He was evaluated by an impressed committee consisting of Professor, Brian Vinter, eScience, Niels Bohr Institute, University of Copenhagen, Associate Professor, David Ferreira, Department of Meteorology, University of Reading, and Professor Joe LaCasce, Department of Geosciences, University of Oslo. He has been supervised by Markus Jochum from the Niels Bohr Institute. Abstract: Baroclinic mesoscale eddies in the Southern Ocean induce a circulation which modulates wind-driven ventilation of the interior ocean, with implication for exchanges of heat and carbon dioxide with the atmosphere. In coarse resolution ocean general circulation models which do not explicitly resolve mesoscale eddies, eddy-induced circulation is typically parameterized with a skew-diffusive tracer flux that depends on an eddy transfer coefficient, κ. Several plausible closures for κ exist, yet consensus on a specific expression for κ remains largely absent in the ocean modeling community and results in uncertain Southern Ocean ventilation rate estimates. With the use of two ocean general circulation models of coarse and eddy-resolving horizontal resolution, this thesis assesses the properties of two recently proposed expressions for κ with the aim to provide guidance towards the optimal closure. First an expression for κ which solely depends on local stratification is examined in a suite of model simulations with varying intensity of the zonal wind stress in the Southern Ocean. The simulations suggest that implementation of a dynamic κ alleviates coarse models from an overly sensitive overturning circulation although the parameterized eddy-induced circulation does not completely match that found in the eddy-resolving model. The latter shortcoming is associated with an overly strong poleward eddy heat transport in the coarse model, which is largely compensated by mean-flow heat transports. In addition, the coarse model demonstrates a centennial equilibration time scale to wind stress change that, if representative of the dynamics, has implication for evaluation of eddy compensation in eddying models. Second, an expression for κ which additionally depends on eddy geometry and energy is investigated. It is shown that this closure derives from a correspondence between horizontal eddy buoyancy fluxes and variance ellipses, which offers a concise geometric interpretation of baroclinic mean-flow stability and vertical momentum transfers. The eddy geometry is examined in the eddy-resolving model to assess its potential to form basis for parameterization. The geometry obeys simple probability distributions and is insensitive to external forcing change, but also possesses vertical structure which relates to the orientation of horizontal eddy buoyancy fluxes with respect to the large-scale buoyancy gradient. This structure is not explained by rotational fluxes and hence represents a possible parameterization challenge. The thesis also presents estimates of κ extracted directly from the eddy-resolving model and provides a discussion on the assumption of horizontally down-gradient eddy fluxes upon which the skew-diffusive tracer flux relies. In particular, this discussion reiterates a previous finding that a dynamically important component of the horizontal eddy buoyancy flux appears unaccounted for in coarse models. 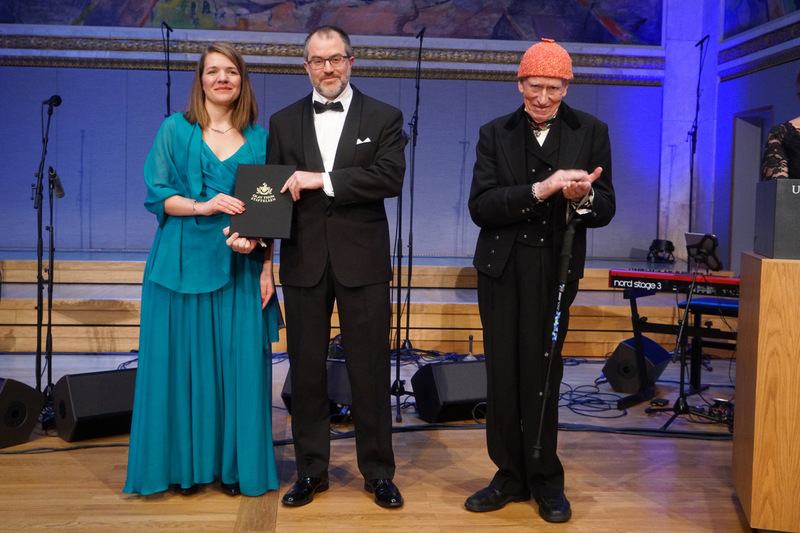 Eystein Jansen receives the Brøgger prize! 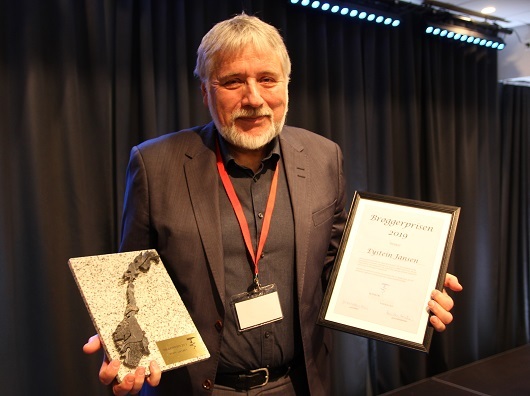 During the annual Norwegian Geological Society winter conference held in Bergen this week Eystein Jansen was today awarded the Brøgger prize. 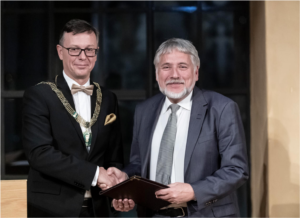 The prize is the highest mark of honor a geologist can be given in Norway and is awarded to persons “…that have contributed in a unique way to understand especially the geology of Norway or geology in general” as written in the prize statutes. The list of Eystein’s important scientific contributions given by the jury is very impressive; first the establishment of the Laboratory for geological mass spectronomy in Bergen in 1983, then the establishment and leadership in the Bjerknes Center for Climate Research (CoE) for 13 years starting in year 2000, his involvement in the establishment of the SapienCE – Centre for early human behavior (another CoE) in 2017, his contribution to the IPCC report and not at least his decisive role for the understanding the ocean circulation in the North Atlantic and link to the variation of ice sheets during the ice ages. The fact that he has brought together geologists and modellers to better understand the climate system (as in Ice2ice) is also mentioned as an important contribution by the jury. You can read about Eystein and the award here, unfortunately only in Norwegian. In the climate system, like the ecosystem, everything is connected. Arctic terns migrate each year from their Arctic breeding grounds to the Antarctic coast. Our recent paper in Nature shows that a similar 50,000 km journey is made by abrupt Dansgaard-Oeschger (DO) climate change events. The specific new result is that each Dansgaard-Oeschger event is accompanied—within a few decades—by a pulse of Antarctic warming and a northward shift in the westerly winds that circle the continent. Similarly, when the DO events abruptly end we see a pulse of Antarctic cooling and the westerlies shift back north. The speed at which the southern temperature and wind changes occur implies that, like the terns, they make their way to Antarctica through the atmosphere. The rapid atmospheric changes are superimposed on more gradual (and already well-documented) changes in Antarctic temperature that appear around 200 years later and that are attributed to changes in ocean heat transport and mixing. To stretch the bird analogy, the terns return north after their foray in the Antarctic sea ice, and similarly Antarctica is not the last stop for the DO signal. The next step is to test whether the wind changes are an important component in driving the next DO event, e.g. through their effects on the overturning circulation, air-sea carbon fluxes and sea ice. Why the southern westerlies shift with the DO events is not yet fully understood, but model studies suggest a plausible chain of events that matches observations (see our ice2ice paper from earlier this year on this topic): abrupt warming in the Arctic means that the thermal equator is displaced north and the SH Hadley cell strengthens; the stronger SH Hadley cell redistributes energy back into the cooler southern hemisphere, in turn strengthening the sub-tropical jet and drawing the westerlies northward. The resulting Antarctic temperature changes are consistent with the observed influence of the Southern Annular Mode on Antarctic climate, suggesting similar atmospheric dynamics may be involved. 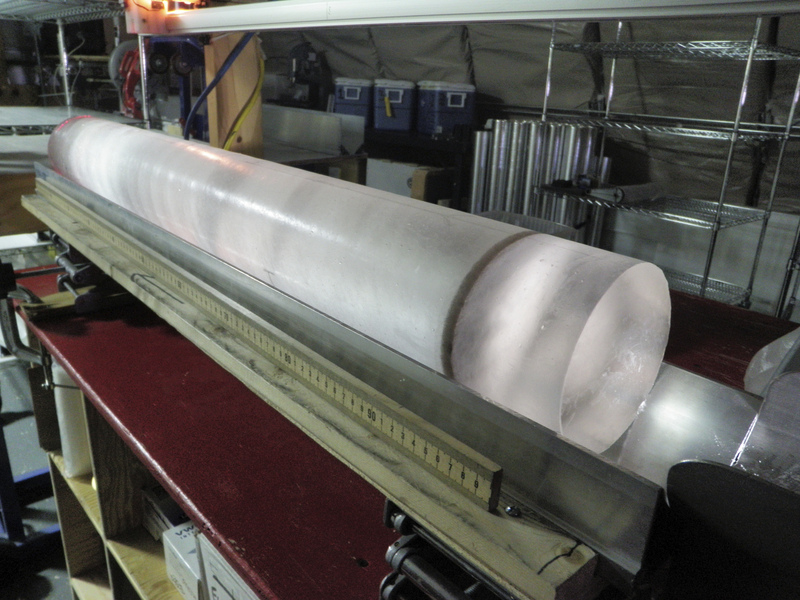 In its details, our study examined ice cores from five different locations around Antarctica and synchronized their dating internally using layers of volcanic ash. 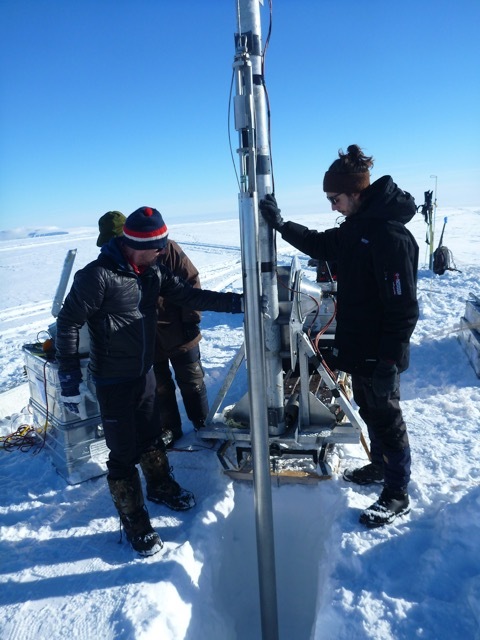 Changes in the temperature and in the source regions of Antarctic snowfall were then analysed by looking at water isotope ratios. Credit is due to Christo Buizert (OSU) who led the study and to Bradley Markle, who published similar findings in 2017 that were restricted to the Pacific sector of Antarctica. Last week a new ice2ice article was published-below the ice2ice authors have written a short version covering the main findings. The full paper can be found here: Geng, Marilena Sophie, Jens Hesselbjerg Hesselbjerg Christensen, and Torben Christensen. “Potential future methane emission hot spots in Greenland.” Environmental Research Letters (2018). Permafrost is defined as ground at a soil temperature below freezing for at least two consecutive years. It is an important part of the cryosphere as 25 % of the northern hemisphere is underlain by permafrost and it stores a large amount of carbon in the frozen ground. In a changing climate and warming Arctic, permafrost is starting to thaw more and more. The frozen organic matter in the ground can therefore reach temperatures above freezing and become available to decay. Decomposition of organic matter produces greenhouse gases. A feedback loop is triggered, higher temperatures lead to thawing permafrost lead to greenhouse gas emission lead to higher temperatures. Depending on the oxygen available to decay either carbon dioxide (CO2) or methane (CH4, which we concentrated our work on) is released. Permafrost can be found in all cold regions like Alaska, northern Canada, Siberia and Greenland. As we had high spatial resolution model simulations of Greenland (figure 1) for present and future scenarios at hand, we used those for a permafrost analysis. The issue with permafrost analysis is that most climate models don’t have permafrost and methane emissions included in their formulation. A high resolution of the soil and complicated processes within it (that are partially still not fully understood) would be needed which is often computationally to expensive at the moment. So our idea was to find a way to derive permafrost conditions and methane emissions from parameters that are in all climate models. In a first step we use an established frost index that uses a ratio of degree days of freezing and thawing to derive permafrost conditions from our HIRHAM5 regional climate simulations. We can compare the permafrost conditions predicted by the frost index with observations from Greenland. 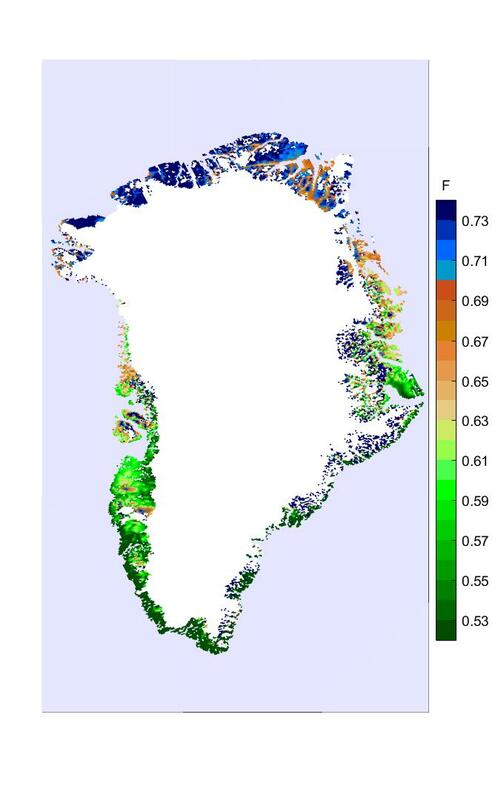 As we are satisfied with the performance of the frost index and the model, we use the index for simulations of future climate scenarios and find spots on Greenland that showed significant thawing of permafrost (figure 2). In a second step, we need to find a correlation between methane emissions from permafrost and some other variable included in the climate model. We can use methane flux data from the GEM (Greenland ecosystem monitoring) project in Nuuk and Zackenberg. We test correlations of methane emissions with air temperature, sensible and latent heat flux. Finally, we find that an exponential relationship between methane emissions and air temperature describe the observations best. As the air temperature rises, methane CH4 emissions increase exponentially. We can use the found correlation all over Greenland with our present day and future simulated temperatures. When we now compare our maps of future potential methane emissions and permafrost thaw we find spots that show both, potential high emissions and thawing permafrost (figure 2 and 3). 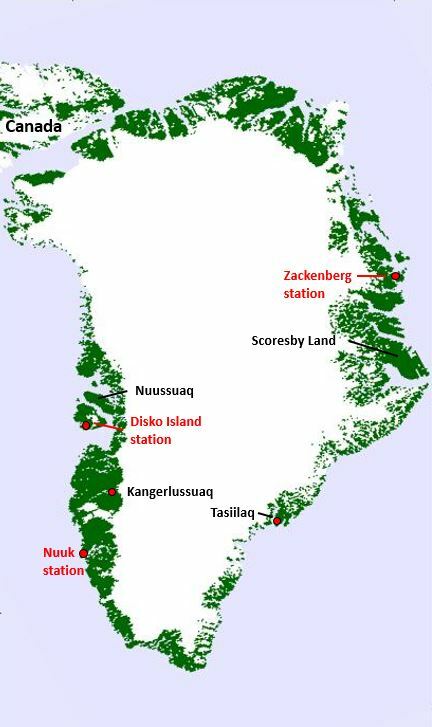 These spots, like Kangerlussuaq and Scoresby land, are likely to show high emission in the future and need some additional monitoring. 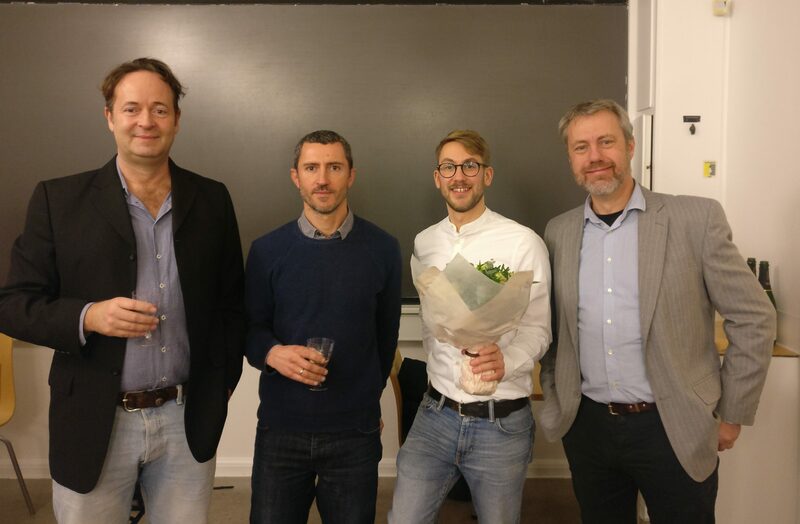 Congratulations to ice2ice PhD Nicholas Rathmann at Centre for Ice and Climate who successfully defended his PhD thesis Monday 26 November 2018, and obtained the degree of Doctor of Philosophy. Nicholas will continue to work as Postdoc at the Centre for Ice and Climate. Abstract: Nonlinear fluid motion occurs naturally in central components of the climate system. Studying such motion is instrumental for improving the accuracy and realism of models of climate components, which has important implications for future climate projections. This thesis presents four studies on the topic of nonlinear fluid dynamics addressing two subjects: the dynamics of ice sheet deformation and the dynamics of the turbulent energy cascade. 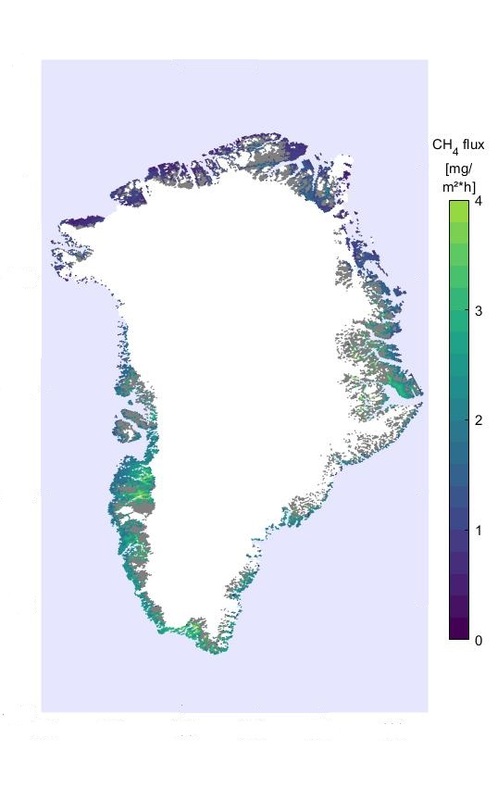 The first study investigates the controlling mechanisms of the observed 2016 seasonal speed-up of Zachariae and Nioghalvfjerdsfjorden outlet glaciers in northeast Greenland, which drain a significant part of the Greenland ice sheet. From surface imagery made available by the newest generation of satellites, state-of-theart velocity maps are derived, and the timings of processes potentially impacting the speed-up are estimated. By combining observations with numerical modelling, it is shown that the subglacial environment exerts an important control over the ice discharge rate of the region, which has implications for estimating the region’s contribution to near-term sea level rise. The second study investigates the influence of strong single-maximum fabrics on the transient deformation of internal layers within ice sheets. By using a new Lagrangian numerical ice flow model, it is shown that discrete, strong single maximum layers — which may account for suppressed shearing along nonbasal crystallographic planes — are a plausible candidate for explaining the disturbed flow observed from ice-penetrating radar transects. 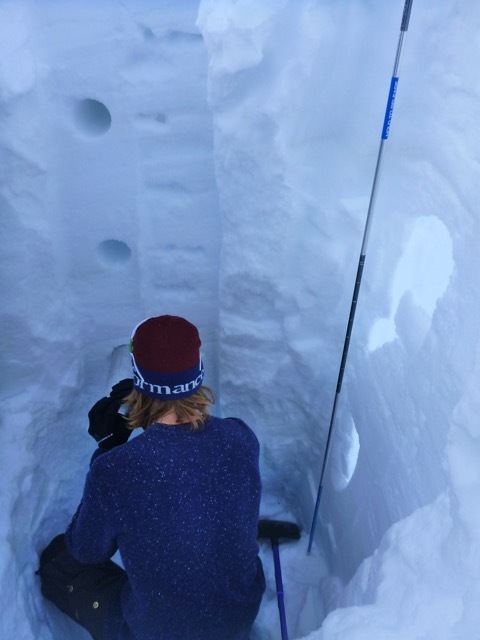 The results have potential implications for interpreting ice-core stratigraphies and chronologies, as well as understanding of how internal disturbances might influence surrounding flow fields. The third and fourth study address the origin of the transfer direction of kinetic energy between scales of motion (upscale/downscale) in fully developed turbulence using the spectral-helical decomposition of the velocity field. In this decomposition, the nonlinear term in the Navier–Stokes equation becomes to a sum over eight distinct types of three-wave interactions. In the third study, a simple model (a shell model) is introduced to investigate the behaviour of the eight types of nonlinear interactions, which is compared to a linear stability analysis, finding a fair agreement. In the fourth study, a subset of the three-wave interactions are shown to conserve a new positive-definite quadratic quantity in addition to kinetic energy, which cause the interactions to contribute to a reverse transfer of energy in three dimensions (small to large scales) in analogy to two-dimensional turbulence. Understanding the energy transfer directionality, and possible ties between two- and three-dimensional turbulence, has implications for geophysical flows such as the free atmosphere and oceans where vertical motion in many places is suppressed, thereby affecting predictability time scales and the transport of energy and momentum in climate.